Impromptu card magic performed with a regular deck of cards. KNOCK THEM DEAD (Paul Gordon): A freely selected card is revealed as the only face-up card in a packet. NAME YOUR CARD (Roy Baker): After a card is selected you cut the deck into several packets. The spectator picks one and from that one card is chosen: The selection. IN THE CODE (Karl Fulves): A card selected by a process of elimination, ends up face up in the middle of the deck. THE MYSTERY OF THE PENTHOUSE (Nick Trost): The four Jacks placed in four different spots in the deck, assemble to the top. ELMER'S WEDDING (Peter Duffie): You show the Kings and the Queens unmatched and then you magically 'marry' them. DOCTOR DALEY'S SANDWICH (Daniel Oreta): The classic Daley's trick with a sandwich variation. SWINDLE COINCIDENCE (Peter Kane): Two decks are shown and shuffled by the spectators. Two spectators remove any spot card. When they count to their chosen number they both arrive at the same card. CAPRICORN (Aldo Colombini): Two Jacks take the 'face' of two indifferent card and then they change into two selected cards. ARE YOU SURE? 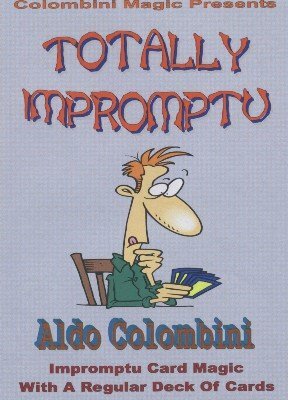 (Aldo Colombini): The 'Ferrari' of the "Dunbury Delusion." I promise you you'll never stop doing this. I have been performing it for over 40 years. TWENTY-CARD POKER (Nick Trost): A spectator makes all the selections and the first player ends up with four Jacks, the second with four Queens, the third with four Kings and you end up with the four Aces. You won't believe the fairness of the selections.